Produced and directed by Zave Smith, Philip & Eleanor tell their story of how a blind date becomes a marriage. Episode 1 was recorded on July 1-5, 2014 in and around Detroit, Michigan. Last winter, I realized I had developed the skills to produce a documentary film about my parent’s lives. Philip & Eleanor Smith were just teenagers when they married in 1945. 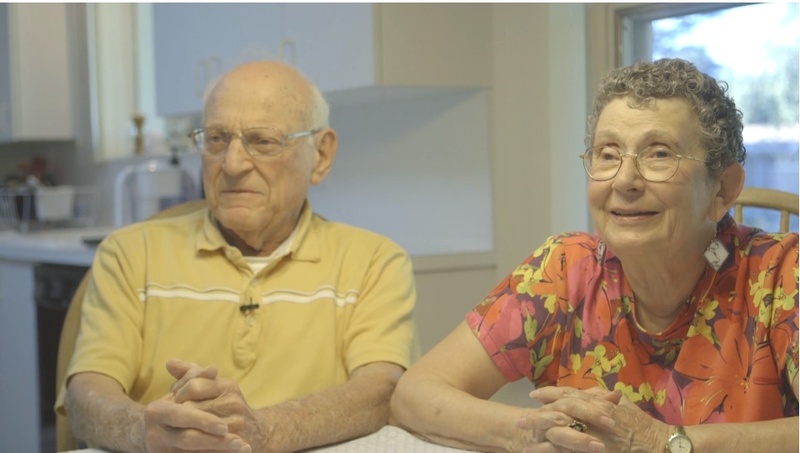 Seventy years later, they are still an active busy couple fully engaged in their own and their family’s lives. Initially I dismissed this idea. It did not feel compelling. I mentioned it to my friend and photographer Steve Prezant. He said, “I can understand why you would not want to do this, but I can tell you that if you don’t, you will regret it one day”. I began this project by developing a list of questions to ask my parents. I shared this list with family and friends who generously contributed additional lines of inquiry. I sent the questions to my parents prior to filming. I wanted to stimulate their memories and to give them time to think about their answers in order to make the filming more fluid. I wanted the footage to not only tell an interesting story I also wanted it to look good and sound right. I realized that I could not be the Director of Photography, The Sound Person, The Lighting Grip and The Interviewer all at the same time. I needed help. So I reached out to Nic Justice who took over the cameras and allowed me to concentrate on prompting my parents and helping them tell their story. My parents can kill you with love and attention. My mother at 87 is still a force of nature and my dad, at 88, is very sharp with a kindness that is very charming. Nic got the full Smith Family experience when we drove to Detroit to film the interviews over a Fourth of July weekend. I first envisioned this as a 30-90 minute single narrative. But the minute I started to edit I soon realized that no one would watch something that long. I decided to break it into six short ten minute episodes that would cover distinct parts of their lives. My goal was to have this first episode finished for our family’s annual Passover gathering. Watching the smile on my parent’s faces, and seeing how their grandchildren and great grandchildren enjoyed hearing their stories turned this personal project into a labor of love. To see more of Zave Smith’s work, please go to his http://www.zavesmith.com/and Altpick page. This entry was posted in Altpick, Photography and tagged 1945, blind date, Detroit, documentary, documentary film, Eleanor Smith, July 4th, narrative, Nic Justice, parents, Passover, Philip, Philip & Eleanor, Smith Family, Steve Prezant, Zave Smith. Bookmark the permalink.